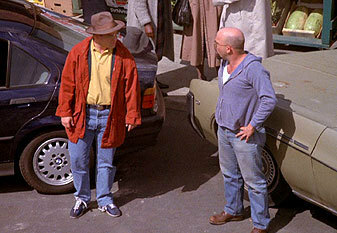 "The Parking Space" is the thirty-ninth episode of the sitcom Seinfeld. The episode was the 16th episode of the third season. It aired on April 22, 1992. The story of the parking confrontation was inspired by a similar incident that happened to Greg Daniels' father. Larry David has said on the season 3 dvd inside look for this episode that George was right in this case, being that since Mike wasn't there first and came in front first, its not his space. The scenes on the street were really filmed outdoors, with the studio audience seated in a large set of bleachers behind the camera crew. As the day wore on, the filming extended into the evening, resulting in the darker lighting of the later scenes in the episode. This episode is one of only two to reference George's brother, the other being "The Suicide". Kramer tells Jerry about something his friend Mike (Lee Arenberg) said about Jerry being "a phony." After borrowing Jerry's car, Elaine comes up with a wild story involving a pack of teenagers with a gun, because the car is now making a strange clanking noise. George drives with Elaine to Jerry's to watch a big televised fight with him. He finds a space, and decides to back into it. He spends a good deal of time positioning himself perfectly (bragging to Elaine about his ability to parallel park). When he starts backing into the space, Mike, also there for the fight at Jerry's, enters the same space, front first. The two argue over who is entitled to the space, all the while blocking traffic. Mike argues that he entered the space first, while George argues that he saw it first and was simply positioning himself, entitling him to the space. People on the street, including a truck driver (played by Michael Costanza, the friend of Jerry Seinfeld that inspired George Costanza's name) also assess the situation and argue with each other over who should keep the space. To make way for the truck, George and Mike get neutral people to move the cars and position them perfectly after the truck is moved. Jerry and Kramer also come down to try to settle the problem. Near the end of the episode, two police officers finally arrive to supposedly resolve the situation. However, when one tells Mike to move his car, the other argues against him, and by now, it is night time. At the end of the episode, Jerry is seen dashing back into his apartment, just in time to see the last few seconds of the count for knockout (missing the actual knockout punch).